Because of the length of this topic, I have tried to make it more digestible by dividing it into a series of posts; this is the third one, and there will be two more. I am more than happy to respond to questions and comments at any point. I hope others find this as interesting as I do. Christianity is an incarnational faith indeed – a faith of embodiment…do we live it though? How do we do Contextual Theology? 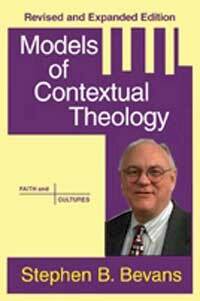 Bevans suggests six ways or models for doing contextual theology, that theologians employ.1 All of them represent different ways of theologizing that takes a particular context seriously and each represents a distinct theological starting point and distinct theological presuppositions. These models arise out of the way theologians combine the issues and difficulties of doing contextual theology and represent poles of thought across a wide spectrum. For example the most conservative of the six models, the countercultural model, recognizes the importance of context but distrusts its sanctity and revelational power. The translation model takes account of context but puts more emphasis on the content of Scripture and Tradition. The anthropological model is more radical, in that it emphasizes cultural identity and its relevance for doing theology more than Scripture or Tradition, which although important considers it a product of contextually relative theologies originating from very specific contexts. The praxis model, on the other hand, focuses on the importance or need for social change as faith and theology is articulated. The synthetic model attempts to balance and make use of all of these models together. Finally, the transcendental model focuses not on a content to be articulated but rather on the subject who is articulating. If one is personally authentic in one’s faith and in one’s being-in-the-world, one will be able to express one’s faith in an authentic and contextual manner. 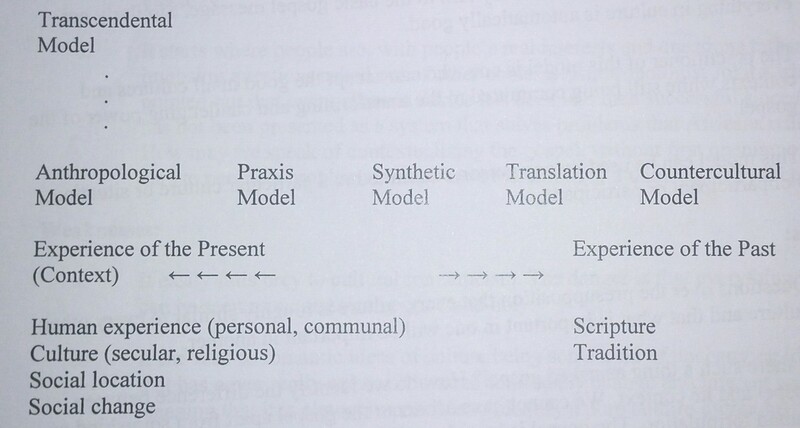 Of the six models, the translation model is probably the most commonly employed and usually the one that most people think of when they think of doing theology in context. This model focuses on articulating the unchanging truths of the Bible in a culturally intelligible manner for a given cultural context. While, as Bevans argues, every model of contextual theology is a model of translation in the sense of there always being a content to be adapted to a particular culture, the translation model insists on the Gospel message being unchanging. In addition, the values and thought forms of culture are understood not so much as being good in themselves but rather as convenient vehicles for the unchanging and universal Gospel truth. The translation model presupposes that there is a supracultural or supracontextual essence to the Gospel that is applicable to all cultures and contexts, although there may be disagreement over what that essence may actually be. This is also the most common model used by expatriates in their attempts to adapt church tradition to a local culture. 1. Takes seriously the message of Christianity as recorded in the scriptures and handed down in tradition. 2. It recognizes the ambivalence of contextual reality. So much of the Bible and of the formulations of tradition, the translator realizes, is simply the product of a culture and needs to be stripped down at every turn to the basic gospel message. Similarly not everything in culture is automatically good. 3. The practitioner of this model is one who can accept the good in all cultures and contexts while still being committed to the transforming and challenging power of the gospel. 4. This model can be used by any person committed to a particular culture or situation, nonparticipant or participant. 1. Questions over the presupposition that every culture is roughly similar to every other culture and that what is important in one will be important in another. 2. Is there such a thing as naked gospel? How do we identify the difference between gospel and its context. We cannot have access to the gospel apart from some kind of human formulation. The gospel is bound up with a context. This model starts at the opposite end of the spectrum and is concerned primarily with “the establishment or preservation of cultural identity by a person of Christian faith”. The model starts with cultural identity and is “anthropological” because on the one hand it focuses on the anthropos of the human person and the good and worth of a persons’ identity and on the other it makes use of the insights of anthropology as a social science. Advocates of this model will work from a creation-centred rather than a redemption-centred theology. In other words, a theology which values human experience and context as essentially good and one that sees the world as sacramental, where God continually reveals himself in daily life and to ordinary people. By implication, then, human experience and culture are centres of God’s activity and therefore sources of theology. This is a model used by theologians doing theology in Melanesia, a prominent example being Ennio Mantovani. 1. It regards human reality with utmost seriousness and attests to the goodness of all creation. 2. It recognizes that scripture and tradition are a series of local theologies. 3. It has the advantage of allowing men and women to see Christianity in a fresh light. Christianity is not automatically the importation of foreign ideas. Rather it is a perspective on how to live one’s own life even more faithfully in terms of one who is a cultural and historical subject. To be Christian, is to be human: it is to find more challenging and always more abundant life. This is a whole new way of doing theology. 4. It starts where people are, with people’s real interests and questions rather than imposing questions asked out of other contexts. Anthropologist John Kirby has pointed out that evangelism in Africa has been less than successful since Christianity has not been presented as a system that solves problems that Africans really have. How may we speak of contextualizing the gospel, without first opening our eyes and ears to people’s problems as they are experienced and understood by them. 1. It easily falls prey to cultural romanticism. The danger is that everything in culture can be seen as automatically good and holy. 2. It can lead to romantic ideas of culture being some kind of unchanging idyllic picture that has never really existed. Cultures continually change and interact with each other, meaning that it is almost impossible to identify a pure culture untouched by others. 3. The ideal of the anthropological model is discover the gospel emerging from a particular situation, but this is never really the case. Practitioners of the model still use theological categories such as sin, grace, justice, trinity and so forth, inherited from other traditions and contexts. 4. As much as the anthropological model tries to fend off influence from other cultures, its method hinges on the western science of anthropology and other social sciences. This model is concerned primarily with the identity of Christians in a context of social change. Its focus is not on knowledge about faith but rather on commitment to positive action to bring about change in society. In this model, theology is not done simply by providing relevant expressions of Christian faith but also by commitment to Christian action. It involves the process of “right acting” as well as simply “right thinking”. Such a model emphasizes concepts of liberation and transformation in society and maintains that these can be brought about through theological praxis, that is action with reflection. Liberation theology remains a prominent example of this kind of theological reflection. As a theological method, the praxis model is wedded to a particular context, it has its “feet on the ground” in a particular social context. 2. By constantly reflecting on one’s daily activity in terms of scripture and tradition (and vice versa), Christianity is understood to bring much to bear on the realities of daily life, and daily life can help sharpen expressions of Christian faith. 1. Critiqued for its close connections with Marxism. Presenting strengths/weakness rather than conclusion is effective inclusion in essay. On the praxis model I was surprised that its weakness is a connection with Marxism. As a historian I have become Marxian in my analyses in that the engine that drives history is economics( think OIL). However I do not support a Marxian based infrastructure. I did not see any connection with Marxism in this model – help me on this. This whole ministry of Jesus is presenting in the Gospel as “right acting” and “right thinking”. I’m not too sure about the link to Marxism – however my understanding is that those engaged in practical theology can have too much of a focus on the material health of people to the detriment of the spiritual health. It doesn’t have to be that way – and I don’t think it means to suggest a direct link, but nevertheless there is a certain closeness which has been criticised. That’s my understanding of it – which might be wrong. The lecturer did talk about it briefly, and I think the above is basically a summary of what was said, but I might have left something out. Yes, I like the strengths and weaknesses approach too. The point of these notes is to be explanatory, not to push for any one particular position. I suppose that I am first struck the academic constructs that are being made to categorize what is essentially a movement of heart, mind and will of individuals. Theology, at least in my mind, is a means to supply to my rational mind reasons for the abandonment of my soul and will to another and to attain the pearl of great price. From that perspective, love or beauty or goodness or whatever lofty virtue that Christ displayed during His Incarnation has won me over but may not have convinced my mind and may have me trapped between the worldliness of my rational thoughts and needs as opposed to my emotional and spiritual goals and aspirations. From that perspective, I would say that theology starts at a personal level and is informed and given legs by ‘good’ theology and keeps a soul ‘on track’ rather than have him think that he will instinctively progress in his interior struggle and pilgrimage. It is only when we are confirmed in our mind and will of that which we have been privileged to have stir within our souls that our theology is made manifest in our entire being and can successfully be carried out into the world. So it is important in that it completes that which Christ began in our individual souls. Otherwise, to look at theology totally from a ‘wide’ cultural level, it takes on more of an identity that looks for all intents and purposes like just another ideology (e.g. Liberation Theology). It turns masses of people into social workers and do-gooders of a social order: i.e. secular humanists. This to my mind, strips the faith of its vitality and its core and dismisses the role of the individual to use this life for the trial that is at hand. As, the Venerable Archbishop Fulton Sheen has said, “there is too much go-go in this world and not enough come-come.” In other words, we go out to evangelize, when we have not yet nourished the indwelling God in our souls. I think you favour the translational model, which will be far and away the most popular for the regulars on this blog, so it seems to me. The point of analysing contextual theology isn’t so much as to construct arbitrary categories for the sake of it, but rather to unfold and expand out the subject so that it may be understood at a deeper level – and then perhaps folded up again, with such better understanding. A lot of academic work is throwing light where there are unknown assumptions, so that those assumptions can be seen for what they are. It is up to the individual to change their presuppositions if they want to, but at least they may be more visible than before. I hope the last two posts help complete the series in a satisfying way for you. I think that I am of a ‘model’ that favors a radical change in my character and life which is an on-going battle to put off the old-man and acquire the new, to bring my soul, my mind and my will into complete conformity to Christ and His Church. If that is a translational model or if this helps in this on-going struggle then I am certainly open to all the help I can get. But excuse me if, so far, I find much of this reminiscent of philosophy and ideology rather than theology and faith; societal change rather than a personal change of self; world justice as opposed to a heart that embraces mercy; or relieving the body of injustices and poverty while leaving the soul floundering for that which is its only desire and thus left impoverished and unsatisfied. I wonder if we are talking too much and thinking too little and attempting to do too much to be silent and pray. Certainly there is a time for all but some things are prerequisites for others. I understand what you mean, but you do seem a bit ‘me’-centred, if I may say so, insofar as your explanation here goes, that is. What is complete conformity with the church of Rome though? I don’t know what that means other than basically not doing anything popes have infallibly said not to do. My previous posts on contextual theology might be worth a re-scan in that regard. Look forward to your comments as this series of posts nears its end. If desiring to ‘die to self’ so that I might ‘live in Christ’ is me centered then so be it: as that is what I have seen in the saints who are my heroes. Christ and the Church are synonymous when thought of as the Mystical Body of Christ . So conformity to Her is, of course, a process of jettisoning my own ‘fallen’ desires and thoughts to embrace Her infallible teachings on morality and doctrine. I have to disagree – it’s not a particularly RCC view at all. What I meant by ‘me’-centred was your assertion to a preference for a theology (I paraphrase) that focuses on the cure of your soul, as opposed to, for example, your soul and those of others too. Sorry for misinterpreting you S. As to the focus being on the cure of my soul being opposed to the cure of other souls as well is like saying that my focus on caring for a seed planted in the ground in order that I might taste the fruit will not produce anything that others might feed upon as well. God’s work never stays hidden for long but bursts forth to the benefit of others. Some people perhaps are ready to take up their cross and follow Christ from the beginning but for many of us we must begin by denying ourselves before we will have the courage and persistence to complete our walk to calvary. No offence, but I was pointing out a nuance of your particular favoured theology. S: is any more going to be said about the ‘Counter Cultural Model’ in later post? Yes: the other three models are broken out in the next post, just as with the three here.